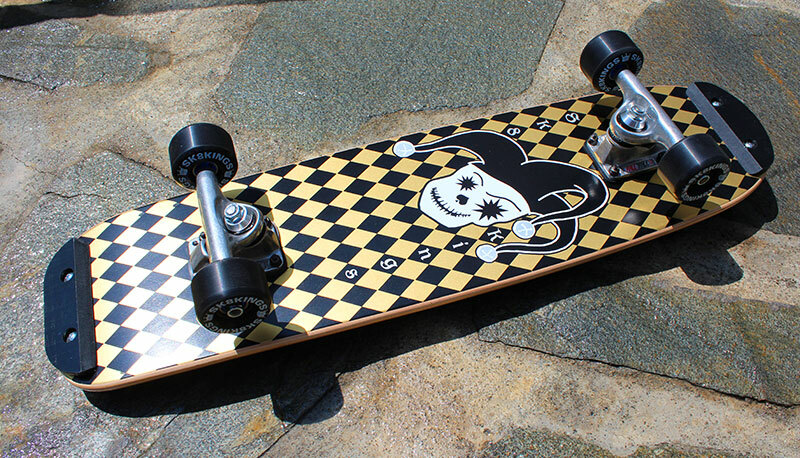 Sk8kings: FREESTYLE / MINI STREET DECK - JESTER RETRO 27 1/2" x 7 1/4" wb 12 3/4"
FREESTYLE / MINI STREET DECK - JESTER RETRO 27 1/2" x 7 1/4" wb 12 3/4"
Jester Freestyle Deck -- Single kick, flat design 27 1/2" x 7 1/4" Wheelbase 12 3/4"
Our Jester Freestyle Deck is crafted in an early-80's retro-style shape -- flat deck (no concave) with a single mellow kick and features a blunt nose and tail for effective control. Made in the U.S.A. of 8-ply hard rock maple for extra strength. 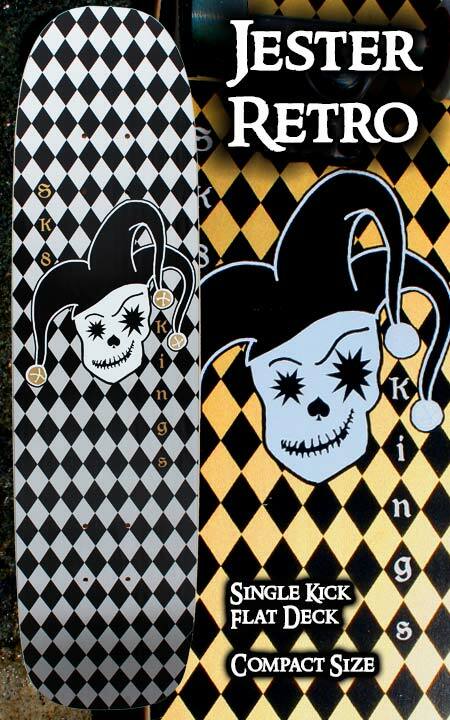 Screened with the SK8KINGS Jester logo graphic in Black Gold or NEW Silver colorway. Complete: Also available as a complete set up -- see Jester Complete (pic above) link in related products below. 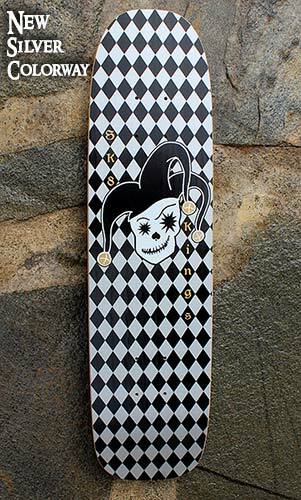 Optional Upgrades: Skid Plates: Add a set of our King Plate skid plates to protect and add longevity to your Jester Deck. Grip Tape: Add a sheet of black grip tape for your deck. Choose upgrades when ordering -- additional charge applies. Note: Skid plates and grip tape come unapplied unless you request otherwise in the notes section. Logo Tee/Hoodie/Hat: Save $5 on a logo T-shirt, Hoodie or Hat when ordered with a deck or complete. Choose the item to add and indicate logo choice and size in the notes section when ordering. For International Shipping Rates inquire by e-mail: info@sk8kings.com Rates vary by country so please include your shipping address in e-mail.